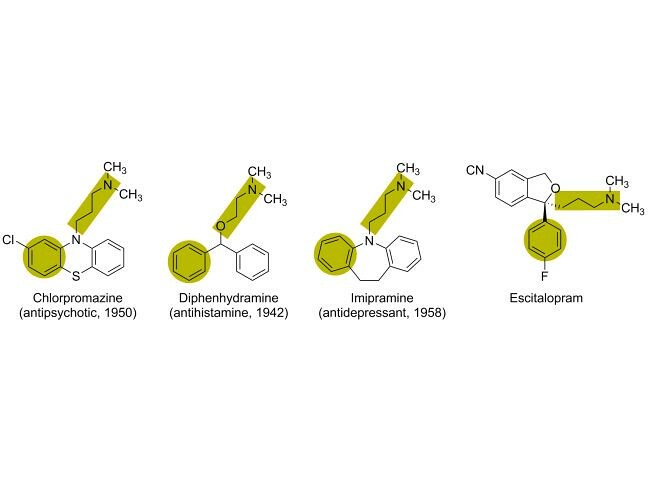 The evolution of antidepressants did not stop with fluoxetine. In the 1990s more substances were prepared and tested that in some cases vary considerably from the chemical structure of fluoxetine. 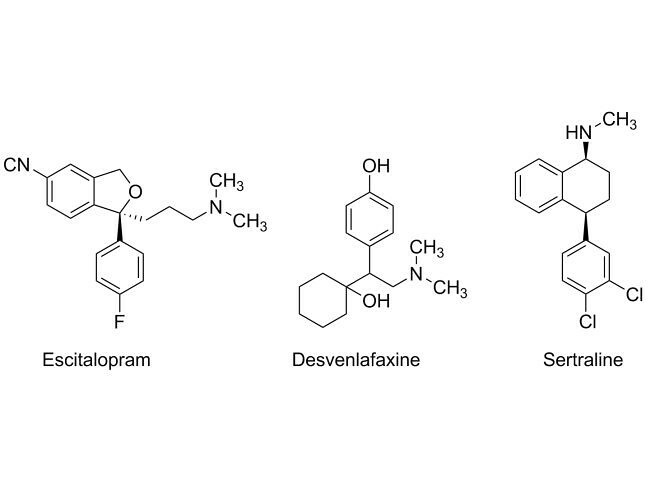 Among the most prominent of these are escitalopram, desvenlafaxine and sertraline which are in current clinical use. The presence of aromatic rings (green highlight) and basic nitrogen atoms (blue highlight) is apparent. 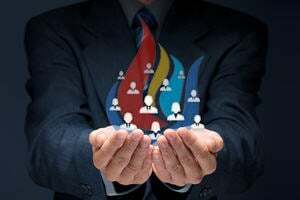 The reason that we frequently see these common functional groups is related to the chemical features of the natural transmitters that they block. 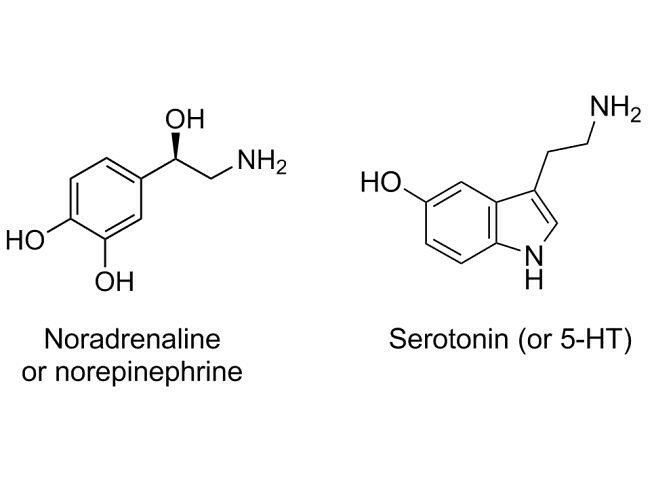 In a similar manner, serotonin and noradrenaline both have an aromatic ring and a short chain to a basic nitrogen atom. 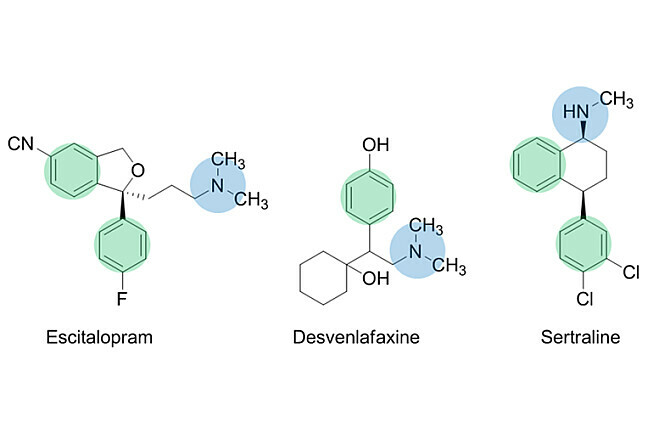 As drugs need to mimic the various neurotransmitters to either match or block their biological function, then it makes sense that we see similar chemical features in their structures. As such, antipsychotics, antihistamines, migraine drugs, antidepressants and so forth, usually contain an aromatic ring and a basic nitrogen atom (amino group).